Blog sobre fotografía antigua y sus fotógrafos. Blog about vintage photography and its photographers. De http://photocollection.alonsorobisco.es. Más de 10 años. Más de 2500 posts. 1 persona. Etudes de façades : maisons, villas, hôtels, les plus récemment construits à Paris et aux environs / choisis par un comité d'architectes et photographies par Lampué, photographe de l'Ecole des beaux-arts. Author/Creator: Lampué, Pierre, fl. 1865-1890. Physical Desc. 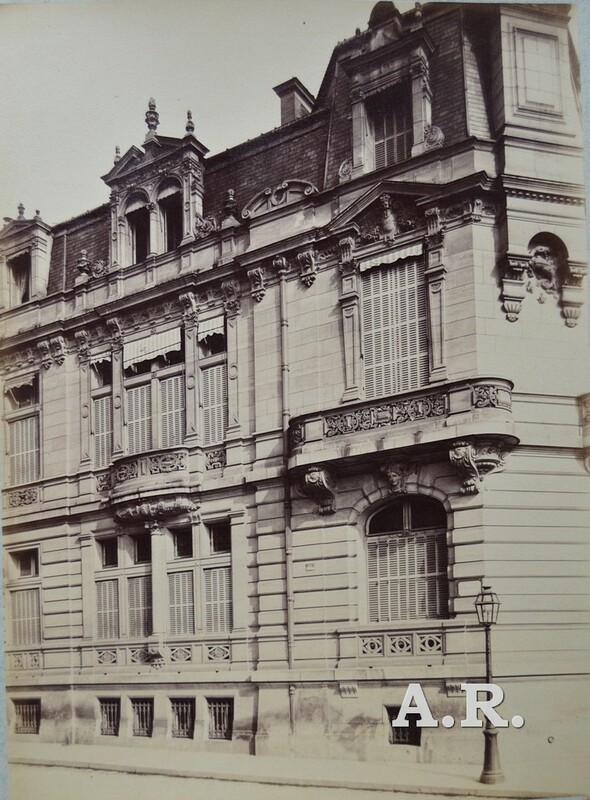 : 1 album (40 photographic prints) : albumen ; image 23 x 16 cm., on sheet 42 x 31 cm..
Summary: Photographs of the façades of recently constructed, late 19th century residential buildings in Paris. Art nouveau designs are not included. Architects represented include: Parent, Caligny, Sansboeuf, Duttenhafer, Lauvistre, Danjoy, Rouse, Galliard, Bayard, Sauvestre, Brière, de Chievere, Cochet, Brilson, Oubry, Cavrier, Roufaeau, Pascal, Lebreton, Salvan, Esuanlo Pelterie, Dunbam, Fébrier, Tronquoire. Notes: Photos are loose in a portfolio and hand-numbered on upper right corner of mount, with the architect's name on the lower right corner of mount. Access/Rights: Open for use by qualified researchers. Appointment required. From 1973 to 1984, Samuel J. Wagstaff, Jr. (American, 1921-1987) assembled one of the most important private collections of photographs in the world. Wagstaff promoted photography as an art form by organizing exhibitions, delivering lectures, and publishing material on his collection. In 1984, a few years before his death from AIDS-related complications, Wagstaff sold his collection to the J. Paul Getty Museum. Numbering several thousand, the collection now forms a cornerstone of the Getty Museum’s holdings of photographs. Pierre Lampué fit des études au petit séminaire de Polignan et à l'Ecole des beaux-arts de Toulouse. 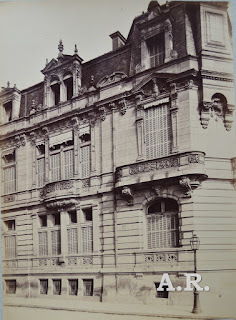 Photographe à Paris du milieu des années 1860 au début des années 1890, il s'était spécialisé dans la photographie d'art et d'architecture. Son établissement avait pour enseigne, vers 1873, "Photographie Franco-Espagnole". Adjoint au maire du 5e arrondissement de Paris en 1888, il fut conseiller municipal du 5e arrondissement (quartier Val-de-Grâce) de 1890 à 1900 et de 1904 à 1919 (groupe des radicaux-socialiste). Il fut aussi président du Conseil général de la Seine en 1904 et 1905. Jean Pierre Philippe Lampué was born in Montréjeau in 1836. Died in Paris in 1924. He studied at the Seminary of Polignan and in the School of Beautiful Arts in Toulouse. He could have travelled to Spain in 1864. In 1865 he stablished in Paris, rue Saint Jacques 237. Lampué become official photographer of the École of Beaux Arts of Paris. In 1888 he became councillor of the 5th District of Paris. In 1890 he became radical socialist and gets elected as municipal councillor of Paris for the Val de Grace neighbourhood. In the council he belonged to the comission of "teaching and beautiful arts". In 1892 he became part of the Honour Comitee for the First International Exposition of Photography and Industry as councillor of Paris. Lampué was re-elected as councillor in 1893 and 1896 but lost in 1900 elections. He was member of the French society of Photography from 1873 to 1885. He was member of the Chamber of Labour Union of Photography. Lampué participated in expositions by the French Society of Photography in 1876 and 1882. He had his own photographic studio in rue Saint Jacques 237, in Paris until 1879. It was called "French-Spanish photography". This studio was later moved to the Boulevard Port Royal 72 in Paris. He finishes his photographic activities in 1890. Lampúe se hizo famoso por una fuerte controversia que mantuvo a través de la prensa con los pintores cubistas. ....That access to all public building should be denied " to a gang of criminals who behave in the art world like yobs and delinquents. ....'Il est absolument inadmissible que nos palais nationaux puissent servir à des manifestations d'un caractère aussi nettement antiartistique et antinational.' . Haciendo la búsqueda correspondiente en la web de Culture France se nos muestran varias fotos de este fotógrafo. Dessinateur et photographe d’art spécialisé dans la photographie d’architecture. ..........American architect Russell Sturgis (1836 –1909) was a leading figure in the development of architectural criticism at the turn of the 20th-century. During his formative years in New York, Sturgis gained an appreciation for architectural history and modern design. An advocate of the American Pre-Raphaelites, Sturgis sought much inspiration in the written works of English architect and critic John Ruskin. Upon his return to New York after extensive travel abroad, Sturgis opened his own architectural practice in 1863. In addition to his success as an architect, Sturgis authored countless articles and books on various architectural subjects. Le musée d’Orsay possède une collection de dessins d’architectures de notre artiste. Ses photos se monnayent sur des sites de vente aux enchères, les estimations de ses tirages peuvent atteindre 900 euros. Inscribed in ink in lower right of plate: Sauvestre Archte. - Albert Levy, developing the architectural photography in the XIX century. Picture by Albert Levy. Cabourg (France). 1870. Tema Fantástico, S.A.. Con la tecnología de Blogger.